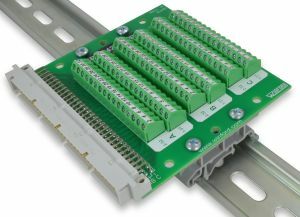 These breakout boards bring all 96 pins of a DIN 41612 Male Style C connector out to angled screw terminal blocks for easy and secure connections. The BRKN4296M-R breakout board contains a Male 96-pin DIN 41612, referred to as Male Style C. Winford Engineering uses the Amphenol / FCI connector part number 86093967113H55ELF or equivalent. The connector pins are located on 0.1" centers. Overall connector length is approximately 3.7". 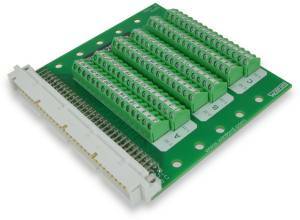 The connector used on this product goes by several different names, including DIN 41612, DIN41612, 3-Row DIN 41612, Backplane Connectors, IEC 60603.2, IEC 60603-2, and EN60603-2. Some common applications for these connectors are listed below. Note that the standards listed may employ more than one type of connector. Carefully verify the connector type used in your application. These Winford Engineering break out boards are perfect for experimentation, prototype work, lab projects, and permanent installations. They are well-suited for interfacing with data acquisition equipment, control systems, or other devices that use the 96-pin 3x32 DIN 41612 connector. A breakout board is sometimes referred to as a "transition module", "terminal board", "terminal block", "breakout box", "breakout adapter", "terminator", or "interface module". These products are available in two different mounting variants. Product numbers ending with -DIN come with DIN clips already installed and ready to snap onto 35mm or 32mm DIN rail. Product numbers ending with -N have no mounting hardware included; they can be easily panel-mounted by using 1/4" nylon standoffs under the mounting holes, and #6 screws. Approximate dimensions: 3.7" x 3.4"